Ownership / Access: No public access. Notes: Melbourne Castle was a medieval castle in Melbourne, Derbyshire. It was built on the site of an earlier royal manor house that had provided accommodation for noblemen hunting in a nearby royal park in the reign of King John. Construction of the castle was started in 1311 by Thomas, 2nd Earl of Lancaster, and continued until 1322, shortly before his execution, but the work was never fully completed. From the early fourteenth century, Melbourne Castle was mainly in the possession of the Earls and Dukes of Lancaster or the crown. Improvements and repairs were made, notably by John of Gaunt, and the building was in generally good condition throughout the fifteenth and early sixteenth centuries. John I, Duke of Bourbon, was kept at Melbourne for 19 years after his capture at the Battle of Agincourt in 1415, and the castle was considered as a possible prison for Mary Queen of Scots, although events led to her incarceration elsewhere. The castle was in decline by the end of the reign of Elizabeth I. Although the stonework was sound, minimal maintenance had led to significant deterioration of other parts of the structure. The manor was purchased in 1604 by Henry Hastings, 5th Earl of Huntingdon, who had his own castle in nearby Ashby-de-la-Zouch. The Melbourne property was then demolished and used as a source for building materials. All that remains of Melbourne Castle today is a section of wall about 15 m (50 ft) long and 4 m (13 ft) high and some foundations; nothing is known of the internal layout of the former building. 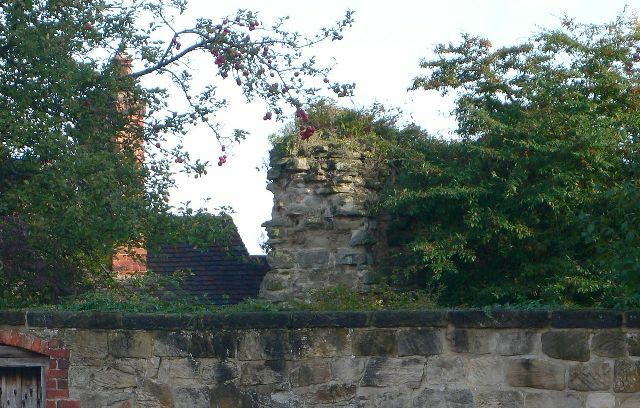 The ruins are grade II listed and the site is a scheduled monument. There is no public access to the site.